It took Albuquerque’s Heather Jo Clark (5-2), of Team Jackson/Winkeljohn, under two minutes to get the fight to the ground and submit Avery Vilche (4-7) this past Friday night at “XFC 18: Music City Mayhem” in Nashville, Tenn. It was a bit of redemption for Clark who suffered a TKO loss in her last fight against Marianna Kheyfets (5-1) at XFC 16 in February when the doctor stopped the bout after the first round due to concern over Clark’s eye being swollen. The XFC continues to be a strong supporter of women’s MMA and is talking about possibly having two female bouts on a regular basis on future cards. Clark said if she had the opportunity to headline an XFC card it would be a dream come true. Clark also talked about how important having the support of her Father is. He attends all her fights (see photo above) and she even said if for some reason he was unable to make it to the fight, she might just say she was injured. Follow Heather Jo Clark on Twitter @HeatherJoClark. 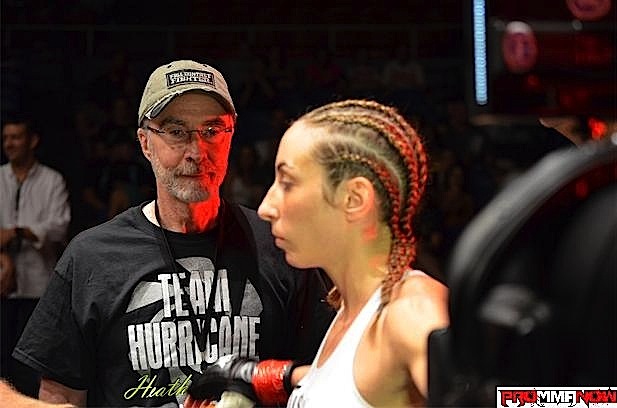 In case you missed Heather Jo Clark’s appearance on Pro MMA Now Radio prior to XFC 18 you listen to that here: Pro MMA Now Radio welcomes XFC 18’s John Salter & Heather Jo Clark. Check out more XFC 18 post-fight interviews and stay tuned for more to come. Also, see our photo gallery from the event, as well as our complete play-by-play commentary on each XFC 18 bout.